Working with Joe Cox and the PMA Bike Ride gave me the chance to balance an awareness of hunger and homelessness with a compelling and energetic documentary style that matched Joe’s personality and the hard work of many volunteers who are moved to respond to the street citizens of Philadelphia. While we’ve all seen photos of homeless people sleeping on the streets, holding signs asking for change, or eating food in a shelter, I wanted the focus of the story to be primarily on Joe’s response to hunger in the city, and his invitation for others to join him. 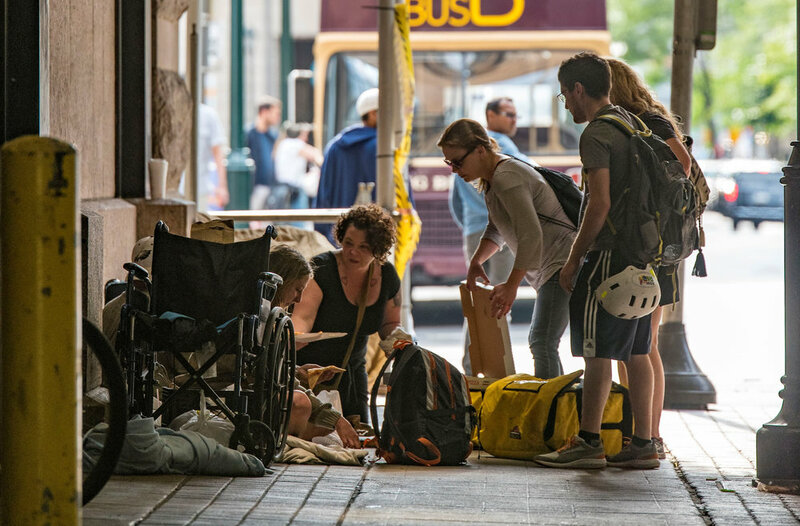 I went into the project with a plan to craft images and a story arc that expressed the nature of Joe’s work while respecting the daily reality of those living on the street. The final result is a video and photo story that doesn’t center “need” or “poverty” or “homelessness”, instead it centers Joe’s agency and the people who work with him. If you have a story ripe for the telling then I’d love to hear from you! To work with me you can send me a message here, or reach me by email at chris@cbephotography.com or by phone at 267-269-1179. 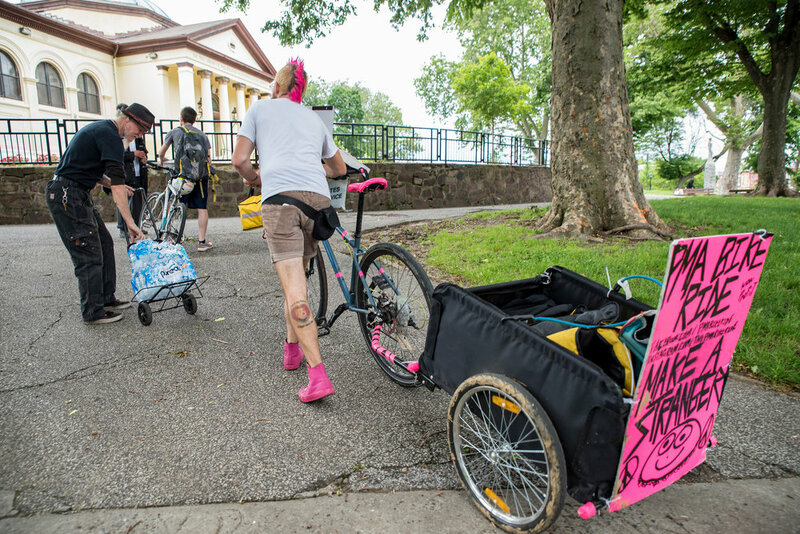 The PMA Bike Ride is a pizza party on the streets of Philadelphia to let people who are hungry know they are not alone, and to give them something tasty to eat. 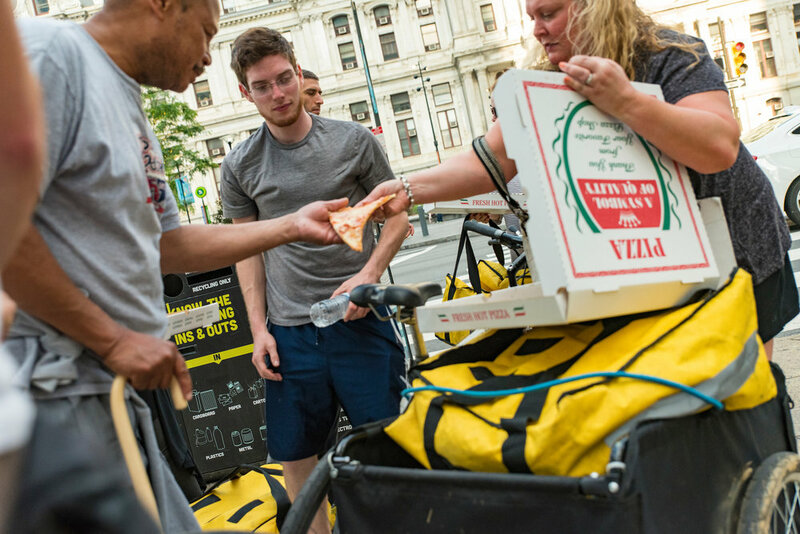 PMA Bike Rides occur regularly in Kensington, Center City, and West Philly, handing out free pizza, water and warm clothes and blankets (during the Winter). The video was selected for the 2018 Bicycle Film Festival in New York City. Joe Cox (center) with Brielle Harbin (far left), Max Robert (far right) and staff at Rosa’s Fresh Pizza in center city. Joe shares pizza with a man in Philadelphia’s center city. He is famous for his pink mohawk and neon signs calling on people to “Make a Stranger Smile”. A PMA Bike Ride volunteer picks up one of many carry-bags of pizza from Four Sons Pizza in Kensington, Philadelphia.